Students protests in Sopore, Srinagar against attacks on Kashmiris outside valley. Screenshot from Youtube Video by Kashmir Despatch. 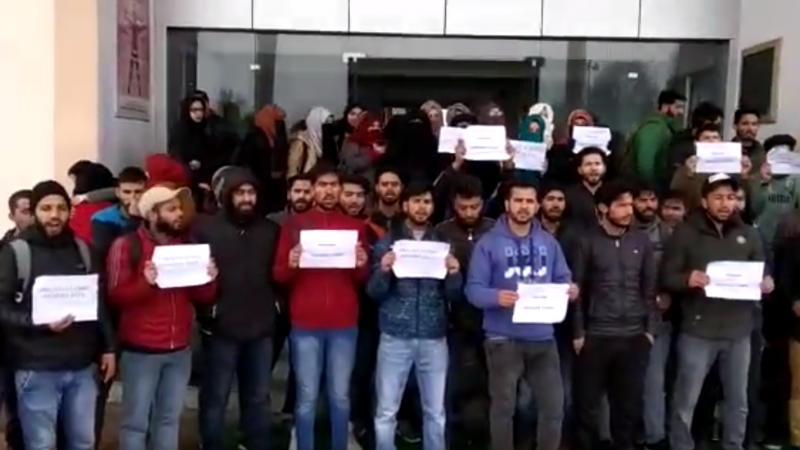 Amid multiple protests across India over a recent terrorist attack in Srinagar’s Pulwama village that killed over 40 soldiers, hundreds of Kashmiri students and businesses facing attacks from right-wing groups returned to the valley from a number of other Indian cities. Numerous social media posts highlighted the terror students faced across the country including in Dehradun, Punjab, Jammu, and elsewhere as anti-Pakistan hysteria gripped the South Asian nation. Javaid Ahmad Khan from Kashmir was abused, heckled & brutally attacked by a mob in Kolkata. Seeds of hate sown by Indian media are sprouting now. Shameful Society. The backlash, stemming from last week’s terror attack by a suicide bomber who used a car-bomb to kill Indian military soldiers near Srinagar on 14th of February 2019, has triggered a spate of fake news hoaxes and anti-Kashmiri propaganda which has led to the persecution of citizens from Indian-administered Kashmir. The Indian government claims and numerous reports state that the terrorist attack was carried out by local militant Adil Ahmad from a terrorist group, Jaish-e-Mohammad (JeM), which India also claims receives sanctuary in Pakistan. Indian political outfits and Prime Minister Narendra Modi who belongs to the right-wing Bharatiya Janata Party (BJP) promised to isolate Pakistan internationally for supporting the militant groups. But, in a rebuttal, Pakistan Prime Minister Imran Khan denied these claims and warned his neighbor that the country would respond if attacked — acts that could lead to an all-out war between the nuclear-armed rivals. Meanwhile, the governor of the northeastern state of Meghalaya, Tathagata Roy, took to Twitter and asked people to refrain from visiting Kashmir and ‘boycott everything Kashmiri’ thereby fanning the flames of anti-Kashmir sentiment. The attack, which made headlines amidst Saudi Crown Prince Mohammed bin Salman‘s visit to India following a meeting with Pakistani Prime Minister Imran Khan has polarized social media with an influx of fake news videos, vengeful posts against Kashmiris and opened a cauldron of political hate speech ahead of India’s general elections scheduled in spring. India and Pakistan have fought three times over Kashmir, highlighting the region’s complex history and its struggle for sovereignty and independence that was promised with a referendum after the birth of India and Pakistan in 1947. Instead, both countries divided Kashmir and multiple human rights cases of abuse, sexual assault and enforced disappearances, have marred the region while citizens seek a ‘referendum’ as outlined by this detailed Global Voices report. Kashmiri activist Shehla Rashid has been using Twitter to aid students who were harassed by college officials or goons to evacuate and travel back safely to their home region. She also highlighted how right-wing trolls were making the process more difficult. Painful instances were captured in videos of Kashmiri students being attacked. A Kashmiri is repeatedly saying, ‘Hamari kya galti hai’, when attacked by a mob. Just watched some horrible videos containing violence, threats, abuse and vandalism against Kashmiris in Haryana, Bihar, Jammu and elsewhere. I have decided against sharing the video footage. In one such video a Kashmiri mela is attacked by a group of goons in Bihar. Meanwhile, fake images and doctored videos were shared on social media after the incident, fanning flames of hatred. A Google employee was shocked at the scale of fake news while Facebook too stepped in to counter the surge. Are there any HR lawyers who can help students detained in Solan HP, Dehradun, Bangalore? Kashmiri students have the right to legal aid. Constitution gives it to them. And no one in this country can deny this right to them. It is time to mourn and grieve but this tragedy also calls for introspection. The last couple of years our national security has been reduced to using our armed forces for political propaganda and pre-election rhetoric. Our country needs a policy not ministers declaring josh. On Tuesday, Indian agencies reported that they killed JeM commander Abdul Ghazi, the alleged mastermind of the attack. But the operations also killed more soldiers, police officers and civilians as Kashmir struggles to return to normalcy.